Home › About Us › 100 years of PLAY! Historic play: These images have been collected from the Play Australia archives some dating back to the 1930's, each one portraying play 'the work of children'. 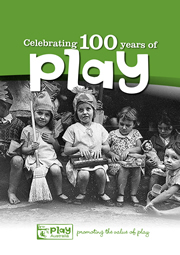 Play Australia (formerly The Playground and Recreation Association of Victoria PRAV) was established to provide quality play opportunities for children in the inner city back in the early 1900s. Professional development programs soon began to train people who worked with children and who 'played' with children in public spaces, the first program was held at Skinners Reserve in South Melbourne. Play Australia has always played a key role in the development of Australian Standards, to ensure that children are protected against unnecessary injury arising from play activities involving play equipment. Play Australia hosted the World Conference on behalf of the International Play Association (IPA) (International Association for the Rights of the Child to Play) in 1993 and is the Australian representative for the IPA.